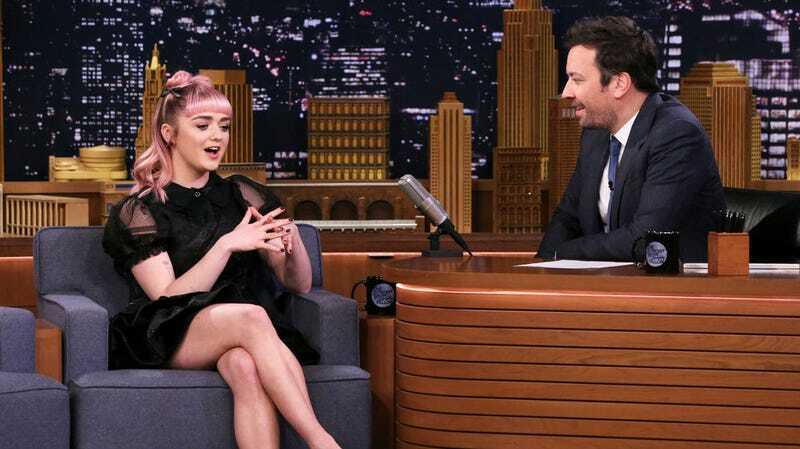 On Monday’s episode of The Tonight Show, Game Of Thrones star Maisie Williams sat down with Jimmy Fallon and Jimmy Fallon’s faint facial hair for a chat about the upcoming end of Game Of Thrones. The centerpiece of the conversation with Williams (a girl’s character has a name, and it is Arya Stark) was an April Fool’s Day joke which, in spite of my documented hatred for such things, I must admit is a pretty good ruse. It works, mostly because Williams is very good at her job, which is acting. (Have you seen her run on Doctor Who? She’s great.) And speaking of acting, we’re not here because of the “spoiler.” We’re here because she also conjured up a hell of an image: her, a blade, loads of blood, and pizza. We’ve cued the interview to 1:35, the beginning of the anecdote in question, but feel free to start it from the top—she is a delight. And a quick heads up that this contains plot details for the fifth season of Game Of Thrones, so don’t click if you’re one of the 27 people not watching the show and aren’t into spoilers. Williams tells Fallon about her first experience filming for the series without a parent on set. When you turn 16, she explains, you’re able to travel alone, and to work adult hours. During the shoot for a particularly “graphic, horrifying scene” not long after her birthday, she was told they’d be moving into overtime—a first for her. It just goes to show: When you film the Game Of Thrones, you win by going home at a decent hour, or you get pizza (so you still win). Game Of Thrones begins airing its final batch of episodes on April 14. Should it ever get to be too much—too much blood, too much violence, too much winter, whatever—just imagine that they’re shooting overtime, so as soon as they take is over, the Night King and Jon Snow and whoever else is left standing will all head off to get a couple slices and leave bloody handprints all over the pizza boxes.